* Updates include discussion of major initiatives such as the Millennial Development Goals, (MDG) to eliminate global poverty * Examines changes in international politics and approaches to global terrorism following the US-led military operations in Afghanistan and Iraq * Extensively revised facts and figures The seventh edition of this perennial stalwart of the Kumarian Press list continues the discussion of the 'new American hegemony' and the 'war on terror' that began with the previous edition. In particular, Isbister addresses changes in international politics and the impact on the global order of the US-led military operations in Afghanistan and Iraq. The author also focuses on major initiatives, such as the UN's Millennium Development Goals, to confront the issue of world poverty. 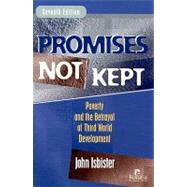 As with all editions of this vibrant text, Isbister writes with clarity and passion, not only about failed promises, but about hope, human potential, and the belief that a just and equitable world system is attainable. John Isbister is a professor of economics at the University of California, Santa Cruz. He received his doctorate in economics from Princeton University in 1969, then joined the faculty of the University of California, Santa Cruz, as a founding fellow of Merrill College, which concentrates on the study of the third world. In addition to all the editions of Promises Not Kept, He is the author of two other Kumarian Press books, The Immigration Debate: Remaking America and Capitalism and Justice. Can the Rich Cooperate with the Poor?